The Christmas Village may have closed but the outdoor skating rink remains open until 28 February. Located at the Stade Nautique in Port Hercule, the 1000 m sq rink is open daily, with night skating every Wednesday until 22:00. Adults and children are welcome, with skate rental included in the ticket price, and helmets and protective pads available on request. 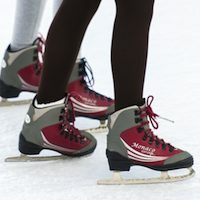 If your ankles and knees aren't up to it, you could try curling instead on a 20 m course at the side of the rink and open during the same hours. For something more competitive, ice-karting is available on Friday, Saturday and Sunday evenings until midnight. The rink is reserved for the Championnat de Monaco de Patinage on 27 Feb, a competition organized by the Federation Monegasque de Patinage in partnership with the Mairie. Spectators are welcome to watch Monaco's youngsters compete and then perform an exhibition show once all the awards have been presented. The rink is managed by Monaco Mairie's Service Municipal des Sports et des Associations. For more information phone +377 93 30 64 83.